Happy Fred Korematsu Day! Most people's response won't be "you, too!" or the like, but "who the heck is Fred Korematsu?" 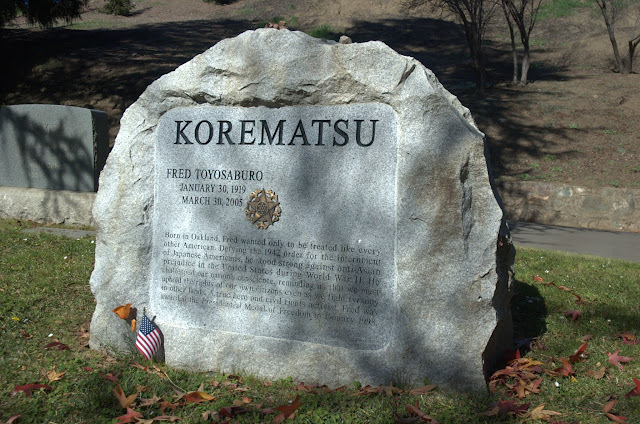 Nonetheless, today, January 30th is Fred Korematsu Day. Fred Toyosaburo Korematsu was a Japanese American from Oakland. When executive orders came after Pearl Harbor to remove people of Japanese ancestry from designated "military areas" and placed in internment camps, Fred refused the order and went into hiding, even undergoing plastic surgery. As an unskilled laborer, he was eligible to receive only $12 per month ($170.69 today) for working eight hours per day at the camp. He was placed in a horse stall with one light bulb, and he later remarked that "jail was better than this." Korematsu faced not only oppression from the U.S. government, he also faced a backlash from Japanese Americans who had cooperated with the government in attempt to show their loyalty as Americans. Fred's case was appealed several times and eventually reached the Supreme Court, where he lost in a 6-3 decision. Read more about the case on Wikipedia, Korematsu v. United States. In the 1980s, Japanese Americans who had been interred received $20,000 each in compensation. A subsequent investigation found that the solicitor general of the U.S. had suppressed FBI data that showed they were not a risk. In 1983, the conviction was formally vacated. The Supreme Court decision has not been formally overturned, though in 2011 they officially noted the decision was in error so that the case cannot be used as a legal precedent. In 1998, President Bill Clinton awarded Korematsu the Presidential Medal of Freedom, the highest civilian honor in the United States. Korematsu spoke out after September 11, 2001 on how the United States government should not let the same thing happen to people of Middle Eastern descent as had been done to Japanese Americans. Fred Korematsu died in 2005 of respiratory failure. He is buried at Mountain View Cemetery, and his grave marker bears a replica of his Presidential Medal of Freedom. One of the last things Korematsu said was, "I'll never forget my government treating me like this. And I really hope that this will never happen to anybody else because of the way they look, if they look like the enemy of our country." A moving story of perseverance in the face of injustice.